To understand how to lose weight it's more important to understand how you gain weight in the first place. The only way to lose weight is to remove the carbohydrates that are causing the fat storage. Once you reduce and eliminate these, then your body will burn the fat already stored as energy. There is no secret surgery, pill, potion, lotion. You will NEVER lose weight until you stop fat storage first by reducing the carbohydrates! Find healthy recipes on drkehres.com. Eggs are a healthy and easy source of protein and nutrients, and can be made in many different ways. Deviled eggs are a great healthy appetizer for your next get together. Be sure to eat the yolk too! Mix the ingredients until fluffy (add the olive oil last). Scoop back into the egg whites and sprinkle with paprika. 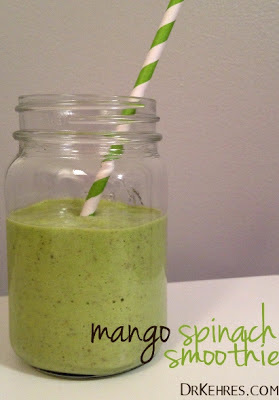 Enjoy Dr. Dan's Shamrock Shake, a healthy mango spinach smoothie! This recipe is gluten-free and dairy-free. Balance is something many of us take for granted – until we lose it. An indication on how well your brain is communicating with the rest of your body, balance typically gets worse with age. But you can improve your balance, it just takes practice like any other skill. Most people sit for the majority of the day which is one of the worst things you can do for your balance. Standing and moving around activates the muscles in your legs therefore improving your coordination and balance. According to The Gerontologist, falls are the leading cause of injury death for people over 65 years of age. Also, on average one in three people age 65 and older fall one time per year. Being proactive and preventing falls is very important for this age group. Especially when it is slippery outside, always take smaller steps as the larger steps you take, the worse your balance gets! Many falls actually happen at night when it is dark. When you aren’t able to use your eyes, it completely changes how your body balances. Now imagine getting up in the middle of the night to go to the bathroom, your vision is not very good and your leg muscles are not as strong as they used to be. Practicing balance exercises with your eyes closed is a great way to prevent falls and injuries. Stand on one leg: alternate every 30 seconds, five times on each side. This helps the connection between your brain and the rest of your body improving balance. Stand on one leg, eyes closed: alternate every 30 seconds, five times on each side. Be sure to hold on to a wall or chair when you start practicing! This helps to prepare your body for walking when it’s dark. If you get really good at this, buy a balance disk and practice on that. Chair squats: Use a chair and practice getting up from a sitting position, 20 times with no hands. Squats help strengthen your legs and hips, creating a strong foundation to prevent falls. Weak leg strength is the main reason people their lose balance and fall. Up and down: Practice getting on the ground and getting up. If you have trouble with this, make sure you practice with a friend to help you. Many elderly people struggle getting off the ground without something to grab or lean on. If they fall in an icy parking lot and nobody is around to help it could mean big trouble! This is a very simple exercise to practice, but very important. Start doing these exercises on a daily basis to improve your overall balance. Injuries from falls could greatly be reduced by doing them.